Both these suffixes denote pain, usually in a specified part of the body. Neural: related to the nervous system or nerves. Algia: Pain in some specific part of the body. Neuralgia: intense intermittent pain along the course of a nerve. Let’s look at an exception to the rule as well: nostalgia, a sentimental longing or wistful affection for the past; this first entered the language meaning homesickness (Greek nostos, return home), hence having a sense close to ‘pain of separation’. 1. Arthralgia/ Arthralgic: Pain in a joint. 2. Causalgia: Severe burning pain in a limb caused by injury to a peripheral nerve. 4. Erythromelalgia: A disease caused by dilation of the peripheral blood vessels, associated with burning, redness of the skin, and pain. 5. Gastralgia: Pain in the stomach. 6. Mastalgia: Pain in the breast caused by congestion during lactation, or other causes. 7. Myalgia: Pain in a muscle or group of muscles. 9. Ostalgia: A pain associated with some abnormal condition in a bone. 12. Rachialgia: Pain in or due to the spine. 13. Abdominalgia: Pain in the abdomen or a belly ache. 14. Acrostealgia: Painful inflammation of the bones of the hands and feet. 15. Adenalgia: A glandular pain; a painful swelling in a gland. 16. Algedonic: Relating to pain; painful. 17. Algesia: The sense of pain; sensitiveness to pain. 18. Algesimetry: The measurement of sensitivity to pain. 20. Algiomuscular: Causing painful muscular movements. 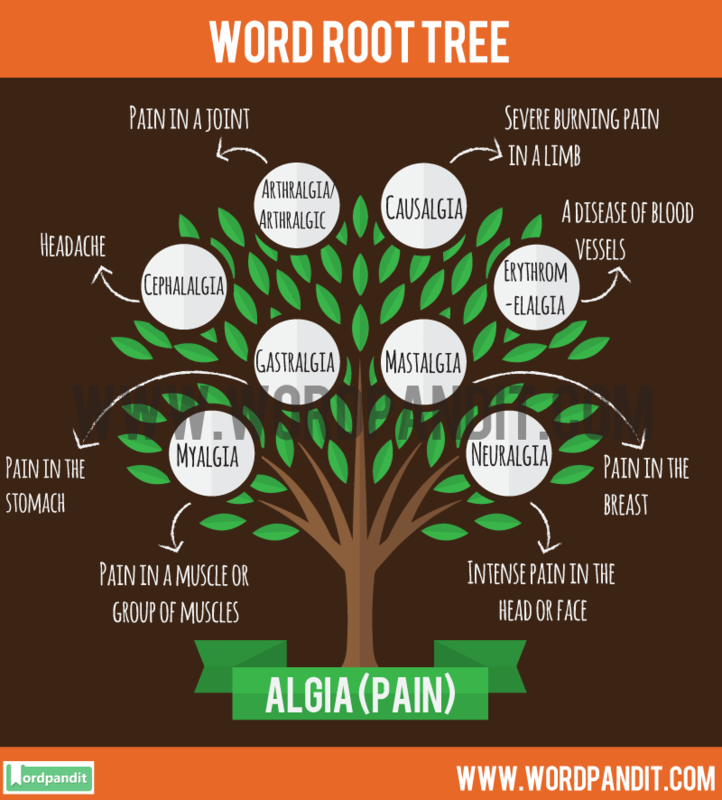 We hope this article on the commonly used Algia Root Word and it has been helpful to you in remembering the words based on the Root Word Alb and enhance your vocabulary.